There’s something irresistible about a good riddle. But what if we were to tell you that there’s a riddle buried deep within the U.S. Constitution? One you won’t find by googling, “U.S. Constitution Riddle” or “Congressional Riddle.” As far as we know, few people ever talk about this riddle, even in high school U.S. History classes or college. And yet, James Madison wrote about it while the states were debating whether or not to ratify the Constitution. And Congress wrestled over it with great passion and fervent debate every ten years for the first 130 years America existed. What’s particularly interesting about what we’re calling “The Congressional Riddle” is that no one has ever solved it. Perhaps frustration explains why this riddle has lain dormant for almost a century. Perhaps it just hasn’t been framed correctly. After all, before you can solve any problem, you have to state it clearly. A little background might help explain the complexity of this riddle, and why its solution has been so elusive that Congress has effectively steered clear of it since 1930. First of all, Congress has the authority to increase or decrease its number of members. They have the opportunity at the beginning of each decade, after receiving the census data (it’s why we conduct a census). And that’s exactly what they used to do. 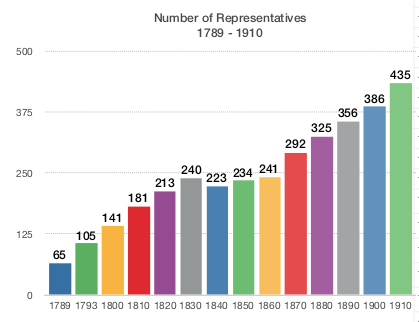 Here’s a graph of the number of members of Congress, beginning with the 65 they started with prior to the first census in 1790, up through the census of 1910 (we’ll show you the amount after 1910 in a moment). 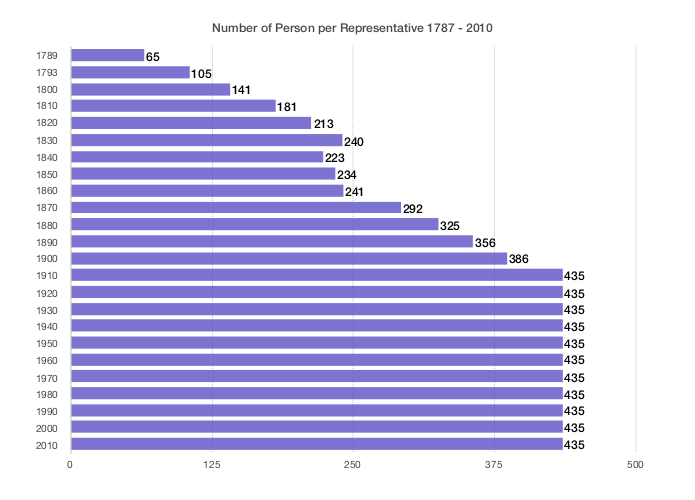 And here’s the number of people per representative for the same period of time. As you can see, both numbers are increasing, in response to the increasing population of the United States. What you aren’t seeing is their method for figuring it out. When the country first started, they tried to have one person in Congress for every 30,000 people. 30,000 was set as a minimum. 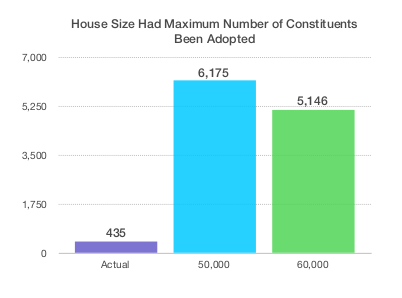 The immediate question arose, “If we’ve set a minimum, shouldn’t we set a maximum?” And the House and Senate both considered the idea, one using the figure 50,000, the other using the figure 60,000. In fact, figuring out a permanent method for effective representation was such an important issue, that had it been resolved, this would have been our First Amendment, sliding the other ten all down a notch. But James Madison – with great vision for the potential growth of the nation, both in terms of geography and population – pointed out the problem with establishing a maximum figure. If you do so, he argued, at some point, Congress will become so big itself that it will no longer be able to function as a deliberative body – it will become an unruly mob. Depending on which number had carried the day – 50,000 or 60,000 – here’s how many members Congress would have had after the 2010 census. So, with no cap on how many people a person could represent, for the first fifty years of America’s history, Congress debated how many people a member should represent, and divided that into the population to determine how many members the House would have. But by the mid 19th century, they abandoned this approach and instead began to set a figure for the size of the House – how many members should there be? By 1910, they had reached 435 members and a little more than 210,000 people per representative. But every ten years, from 1790 to 1910, they did their Constitutional duty and and used the census to reapportion districts. After the 1920 census, for a number of reasons, Congress didn’t do its duty. It took nearly the entire decade to agree on things, and what they agreed on was to freeze the number of members at the figure from 1910. More importantly, they put a mechanism in place that essentially made changing the figure politically impossible to do – if they couldn’t agree on a new number for the size of Congress within 60 days, then the old number applied. That’s why we have 435 members of Congress. And have for over a century. 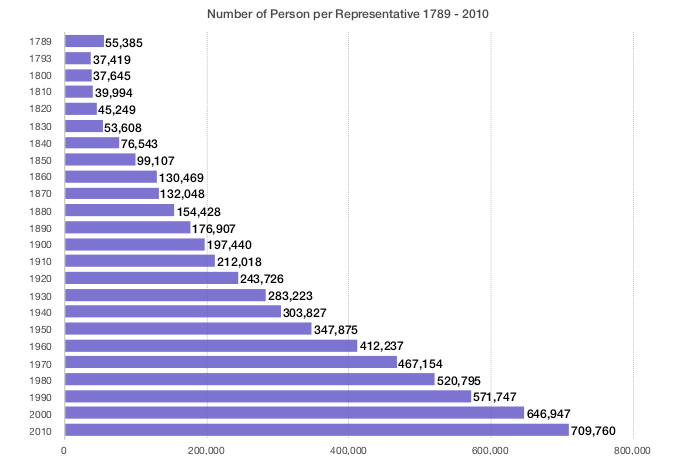 Here’s the consequence – the number of constituents per representatives has increased every year. By 2020, it will be close to 750,000. By 2060, it will very likely be close to 1,000,000. 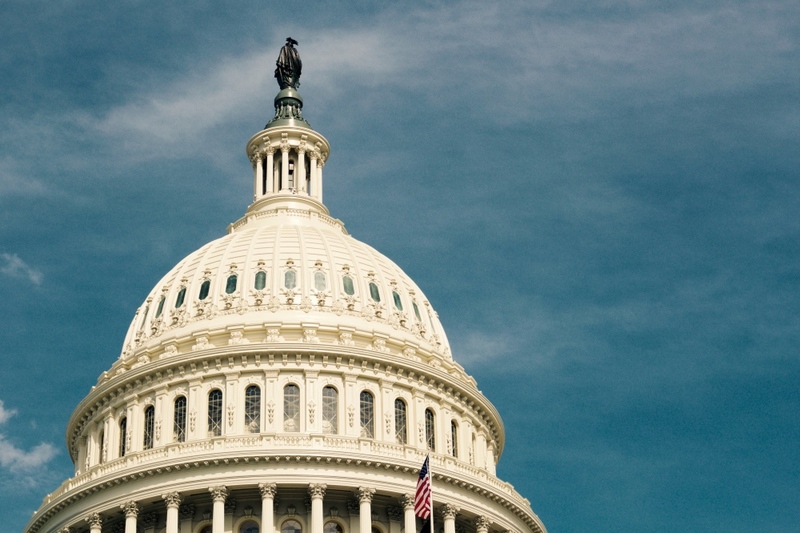 Essentially, Congress decided half-the-riddle – “How can Congress keep its number of members manageable?” There answer has been to limit membership to 435. But the other part of the riddle, “How can Congress keep district sizes manageable?” has been neglected. It’s as if the American people are unaware the question can be asked. Now, we are not suggesting that Congress go out and increase its size after the 2020 census. First of all, it would require Congress to do something, when an enormous benefit of our approach is that our solution only requires us to do something. Plus, it’s possible – as crazy as this might at first seem – that 435 is too big. Maybe Congress hasn’t solved the first part of the problem, after all. Our solution to the problem is to do an experiment – and remember, the reason America is so great and is such a beacon to people around the world and has been for over two centuries, is that the United States is at its very core an experiment in self-government. And at the very core of self-government is the question of creating a structure for effective representation. Like any good experiment, ours is testable and falsifiable. And we’re looking to the Constitution for guidance. 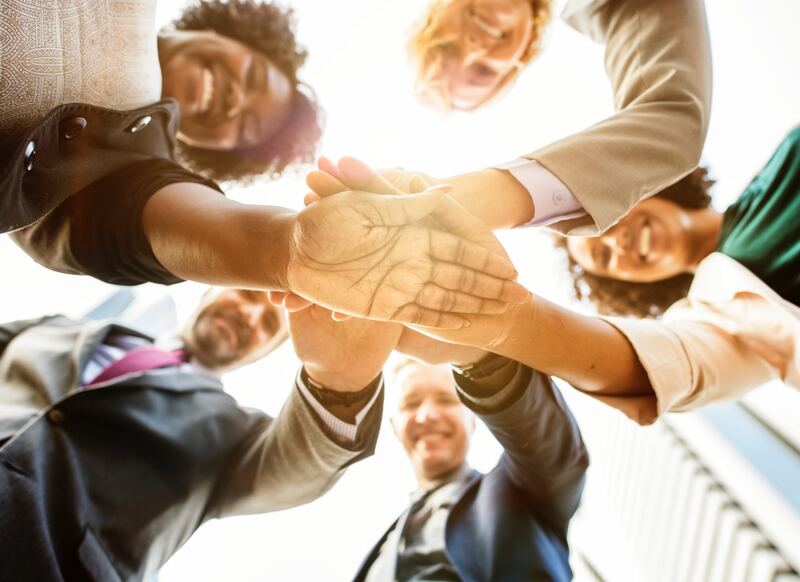 After the first census in 1790, Congress tried to get the number of persons per representative as close to 30,000 as they could. In fact, to further demonstrate just how important this question was at the time, they violated the Constitution to get as close to that figure as possible, at first submitting that Connecticut with a population a few hundred people short of 90,000, should have three representatives. In a great bit of irony, George Washington – the man who asked the Constitutional Convention to lower the minimum threshold from 40,000 to 30,000 – issued the only veto of his first term over the fact that Connecticut would have violated the minimum number had they been given three representatives. Since the communities we’re creating will all be within the existing districts, we do not have a similar constraint. 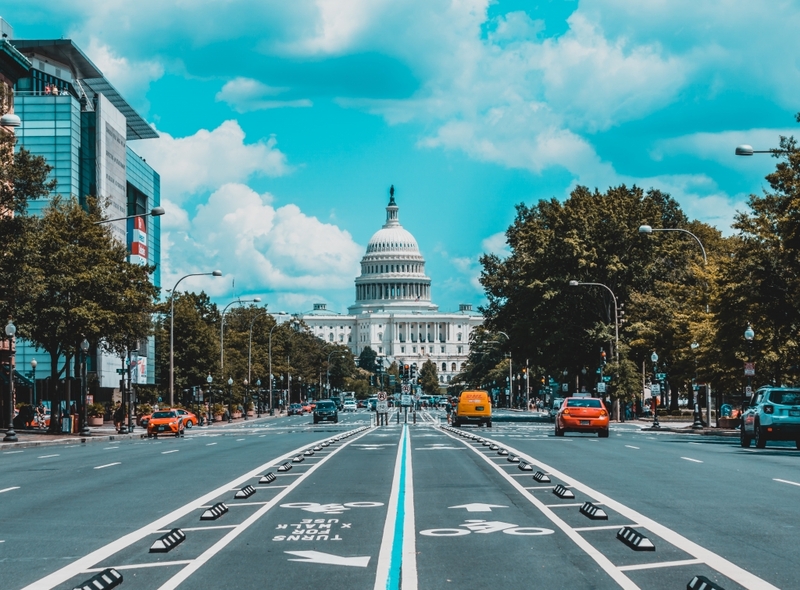 We’re out to establish Congressional Communities with about 30,000 people in each to see if a single individual – with all the tools modern times make available especially in terms of travel – can represent 700,000 people. 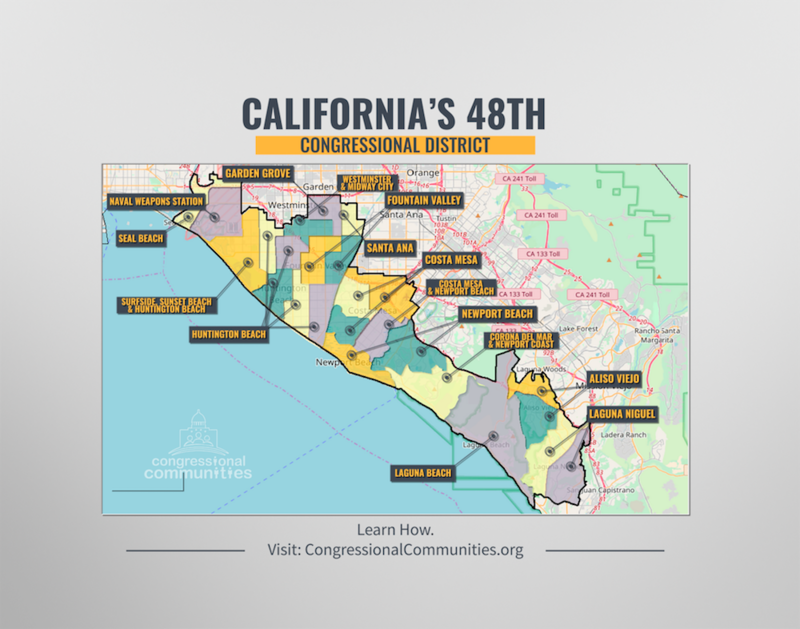 We are starting with California’s 48th Congressional District. Here’s a map of the district with the different boundaries for 25 communities. Some of these areas have fewer than 30,000 people, some have more. 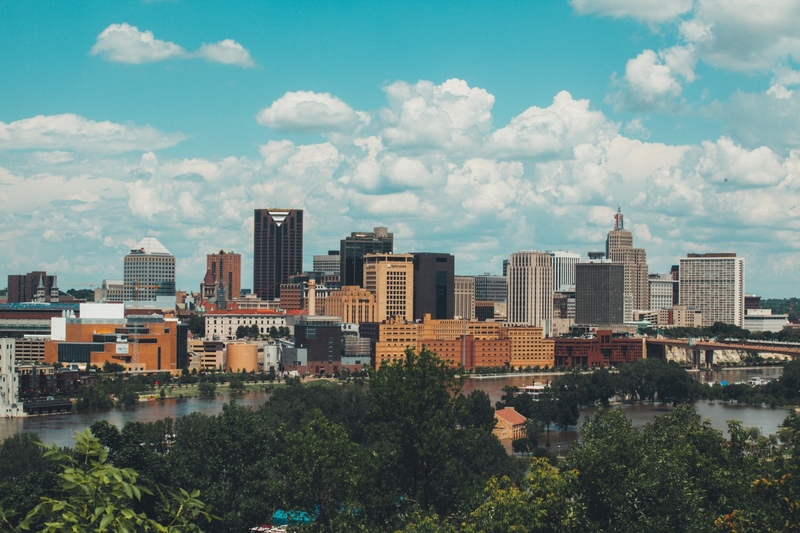 Our goal was to keep it within 20% on either side, but to be practical and respect existing communities, like cities, and geography, like mountains and rivers.  As part of the test, we’ll be looking to see, as the communities take hold, if people feel better informed, if they’re overall opinion of Congress improves, particularly when compared to districts that have not yet established communities.